Just like cleansing, exfoliation is essential in your skin care regime. Exfoliation encourages healthier, smoother and more even-toned skin and can also prevent acne and minimise pores. 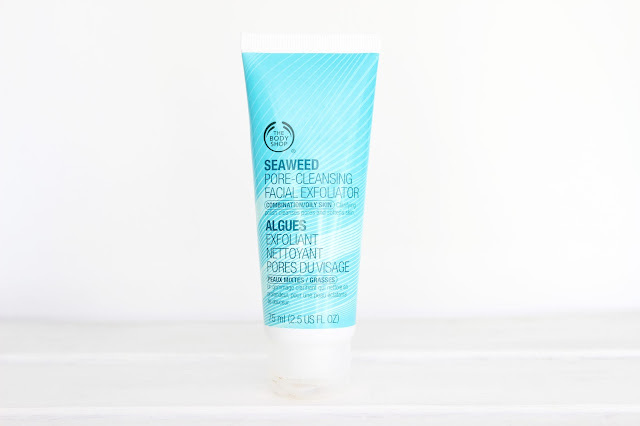 There are hundreds of exfoliating products on the market, from electric exfoliating brushes such as the Magnitone pulsar to more affordable options like The Body Shop Seaweed Pore-Cleansing Face Exfoliator. The Body Shop Seaweed Pore-Cleansing Facial Exfoliator is refreshing and really does help to cleanse pores and rebalance surface oil. Designed for combination skin this exfoliator has a gel like constancy with mixed micro beads that aren’t too harsh or abrasive (it also smells pretty darn nice too). I use this product 2-3 times a week, taking a pea-sized amount and massaging it thoroughly into damp skin. After massaging the product for a minute or so, I find it softens and turns into a creamy wash, which is unlike any other exfoliator I have tried. Once I have rinsed the product away, my skin is left feeling extremely smooth. As I have combination/dehydrated skin, it does on occasion leave the my skin feeling a little tight, but I like to follow up with my Aqualia Thermal Fortifying & Soothing 24hr Hydrating Care Serum which takes that tightness away. All in all, this product is by far the best facial exfoliating product I have used. It’s great for maintaining healthy skin and I was pleasantly surprised to see a visible reduction blackheads! It is complete bargain, priced at £10.00 and can be bought online, or in-store at The Body Shop.